are from 778th BS Tim Chadwick's collection. I really enjoyed your web site. My father served in the 464th BG 778th BS during WWII. His name was Tim Chadwick and he was from Texas. I have a box full of pictures and newspaper clippings from that time. I have many "nose art" pictures. One of these planes was named after me. I was born in 1942, so I was a baby then. 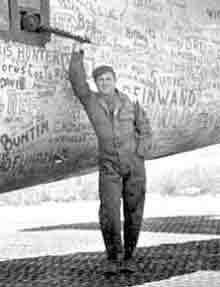 All of these were from 464th BG 778th BS. My dad was a pilot, but did not pilot the planes in combat. He dropped the bombs. He did pilot planes from Trinidad to Africia and to Florida for a short while during the war but this was straight flying, not combat. He started out as a mechanic. My mom said he flew little planes all the time when he was young in Texas before the war. She said he was a holy terror and used to love to "buzz" the local courthouse. He passed away in Jan. 1977. He was 68.